The Kingdom. The Family. The Fall. SANTA MONICA, CA (August 31, 2016) – Catch OWN’s biggest series launch in the network’s history, and this summer’s top new cable show, when the addictive family drama “Greenleaf” Season 1 arrives on Blu-ray (plus Digital HD) and DVD (plus Digital) December 6 from Lionsgate. Executive produced by Oprah Winfrey (Lee Daniels’ The Butler), and created by Emmy®-nominated writer/producer Craig Wright (TV’s “Lost” and “Six Feet Under”), the show follows one woman’s return home to her family – the leaders of a megachurch – and the revelation that they don’t always practice what they preach. “Greenleaf” stars Merle Dandridge (TV’s “The Night Shift”), Keith David (TV’s “Community”), Lynn Whitfield (TV’s “The Josephine Baker Story”), Kim Hawthorne (TV’s “Rake”), Lamman Rucker (TV’s “Meet the Browns”), Deborah Joy Winans (TV’s “Whitney”), and Desiree Ross (TV’s “Falling Skies”). The series is currently available on Digital HD. “Greenleaf” centers on the journey of estranged daughter and disillusioned preacher Grace Greenleaf (Merle Dandridge), who has returned home after 20 years on the occasion of the mysterious death of her sister, Faith. As she reenters the world of Calvary Fellowship World Ministries, the Memphis mega-church run by her powerful parents Bishop James Greenleaf (Keith David) and Lady Mae Greenleaf (Lynn Whitfield), it becomes evident that things are not as virtuous as they seem…and that the family’s outward display of faith hides sin and misdeeds. The home entertainment release of “Greenleaf” Season 1 includes two behind-the-scenes featurettes, bloopers, and one-on-one conversations between Oprah Winfrey and executive producer/director Clement Virgo and actors Merle Dandridge, Keith David, Lynn Whitfield, and Regina King. 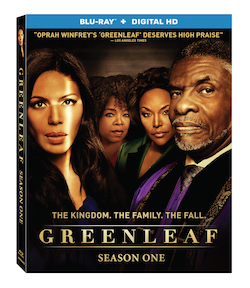 “Greenleaf” Season 1 will be available on Blu-ray and DVD for the suggested retail price of $34.97 and $34.98, respectively. Title Copyright: Greenleaf © 2016, Artwork & Supplementary Materials ™ & © 2016 Lions Gate Entertainment Inc. All Rights Reserved. Feature Run Time: 549 Mins. Lionsgate is a premier next generation global content leader with a diversified presence in motion picture production and distribution, television programming and syndication, home entertainment, international distribution and sales, branded channel platforms, interactive ventures and games, and location-based entertainment. The Company has nearly 80 television shows on 40 different networks spanning its primetime production, distribution and syndication businesses. These include the ground-breaking hit series Orange is the New Black, the fan favorite series Nashville, the syndication success The Wendy Williams Show, the hit drama series The Royals, the Golden Globe-nominated dramedy Casual and the breakout success Greenleaf. The Company’s feature film business spans eight labels and includes the blockbuster Hunger Games franchise, the Now You See Me and John Wick series, Sicario, Nerve, Roadside Attractions’ Love & Mercy and Mr. Holmes, Codeblack Films’ Addicted and the breakout concert film Kevin Hart: Let Me Explain and Pantelion Films’ Instructions Not Included, the highest-grossing Spanish-language film ever released in the U.S.